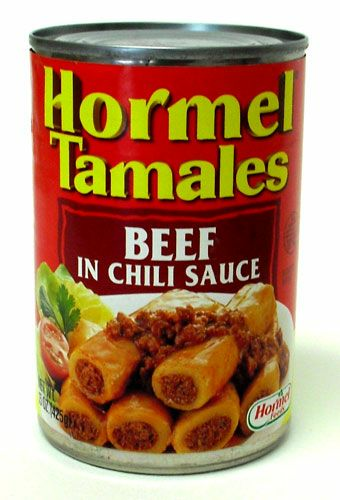 Hormel Beef Tamales in Chili Sauce is a delicious meal in a can. Its very easy to prepare just pop open the can, put on a skillet and heat. 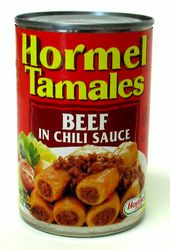 Hormel Beef Tamales in Chili Sauce brings you flavor that's close to home!! Ingredients: water, beef, tomatoes (water, tomato paste), Corn meal, corn flour, masa harina, salt, chili powder (chili peppers, flavoring), modified food starch, paprika, spice. Los Tamales de Carne de Res marca Hormel son una delciosa comida en lata. Son faciles de preparar, solo abre la lata, ponlo en un sarten y calienta. Los Tamales de Carne de Res marca Hormel te traen el sabor casero. Ingredientes: agua, carne, tomates (agua, pasta de tomate ), semola de maiz (corn meal), harina de maiz, masa harina, sal, chile en polvo (chiles, saborizante), almidon modificado, paprika, especia. For a 2 minute microwave meal these things hit the spot every time. I have them at least once a week for an easy dinner. Great with hot sauce on top! ProsCheap, fast ,easy, reputable company, excellent availability, stores in pantry for a long time. ConsFattening. I would not go to eating these all the time! Nice, quick and easy meal! I ordered a can of these the other day, and they were very good. I added some red pepper flakes a bit of Jack Cheese several dashes of Bufalo Jalapeno Mexican Hot Sauce. I love eating them with Plain Saltine Crackers. I'll be ordering again. ProsQuick and easy meal. Tastes pretty good. given the price, and the fact they are in a can - I'm quite impressed. The sauce is a bit chef-boyardee-ish, but the tamales are quite tasty! yes I like it but I would love the real tamales but if you don't have the real thing this are great.